The official groundbreaking ceremony of the new $60 million “home of American tennis” in Southeast Orlando will take place next week. During the groundbreaking of the 63-acre campus new renderings will be unveiled, and the official name of the campus will be announced. 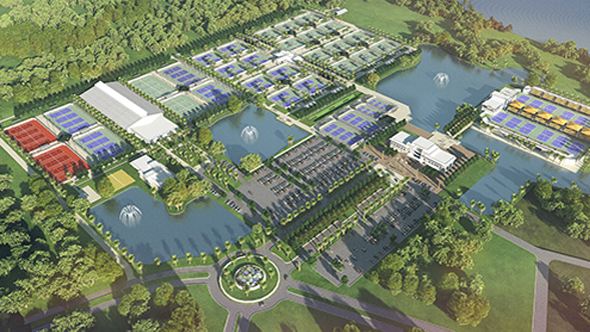 The new complex will be built between Nautica and James Bay drives in Lake Nona, and will feature more than 100 tennis courts, offices and a lodge for players to stay in while training at the facility, which is expected to open next year. That lodge could be the site of a new $2.2 million-$3.3 million mega-lagoon— an 11-acre man-made recreational lake with a Caribbean-style beachfront being designed by Miami-based Crystal Lagoons US Corp. Along with the jobs it’s bringing to the region, the complex also is slated to bring a bigger boost to the region’s tourism industry, which welcomed 59 million visitors in 2013.